Direct flights between Ukraine and Russia will stop on Sunday, as new sanctions initiated by Kiev come into effect. 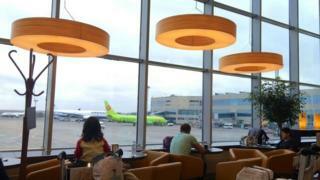 Moscow first called Kiev's ban on Russian airlines "madness", then announced that it would mirror the move. Ukraine now says flights will end at midnight on Saturday, after last-minute crisis talks failed. Up to 70,000 passengers a month will be affected. The sanctions are intended to punish Russia for annexing Crimea and supporting armed rebels in eastern Ukraine. The fact that they have been introduced now, when a ceasefire is finally holding on the ground, shows how bitter relations remain. Russia has accused Ukraine of shooting itself in the foot with the move, pointing out that most passengers are Ukrainian travelling to work in Russia, visiting relatives or in transit. But two-thirds of all passengers travel on Russian airlines. Russia's transport minister has estimated that the loss in ticket sales to both countries will run to around $110m (£73m) a year. The ban is already angering passengers from both countries. "The government does things and it's the people who suffer," Ukrainian Alexander Vyshnevsky said, after checking-in for one of the last remaining flights to Kiev from Moscow. He had been visiting his Russian wife and daughter. "Russia and Ukraine are like one country for me. Half of Ukraine is married to Russians. So this is total nonsense," Mr Vyshnevsky added. "This is stupid," Russian Konstantin Fokin agreed, before his own flight to Kiev. His sister lives in Ukraine and travelling to see her will now be difficult. "Lots of people have relatives in both Russia and Ukraine and they want to communicate. It's up to the authorities to stop this stupidity," Mr Fokin said. Last-minute talks to find a compromise are under way - so far to no avail - and the chances of success look slim in this climate. So as of Sunday, passengers will be forced to take longer, more expensive routes via third countries, or to brace themselves for a 13-hour trip by train.